Since I made some homemade pork and beef stock a few days ago, I knew soup was going to be on the menu one day this week. Today is the perfect day. My class was cancelled due to the winter storm that pounded the entire Midwest the last few days. It’s cold and wet and disgusting out. I spent hours yesterday and today shoveling the driveway, and I wanted something comforting, warm, and delicious. I was going to be home all day, so caramelizing and simmering wasn’t going to be a problem in the slightest. 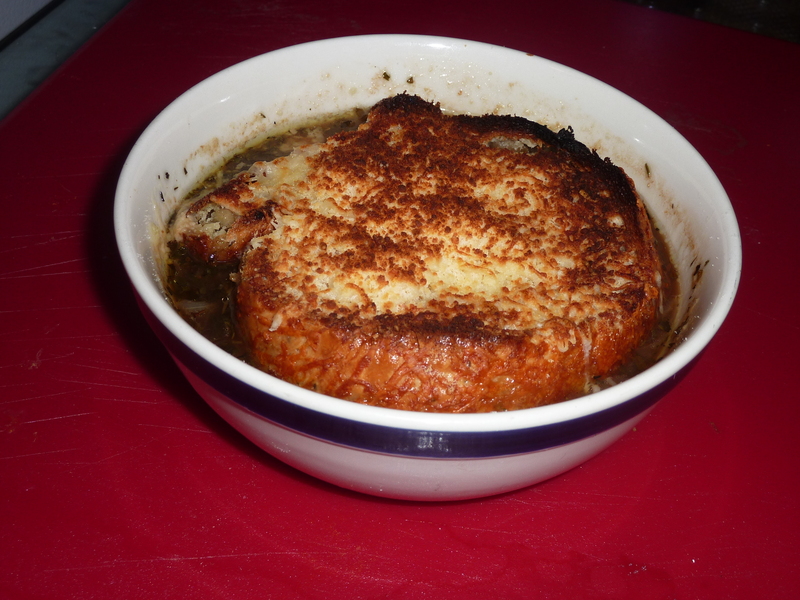 I was going to do a classic French Onion, but then I realized I had some mushrooms I wanted to use up and didn’t have any white wine in the house, so this caramelized onion and mushroom soup is riff on a French Onion soup. 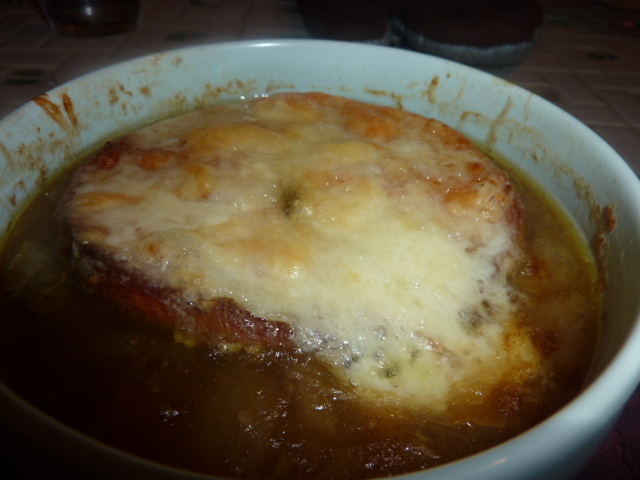 The flavors were very bold and the mushrooms lent a nice bit of meatiness to the soup. Though my stock was made from both beef and pork, a beef stock would work quite well here, too. The red wine imparted both a lovely, deep red/purple color and a rich wine flavor. Heat 2 tbs. of olive oil and 1 tbs. of Brummel & Brown in a medium stock pot. Once the oil is hot and butter is melted reduce heat to medium-low and add sliced onions. Sprinkle with a large pinch of kosher salt. Stirring frequently, caramelize the onions. The caramelized onions are absolutely essential to the successful outcome of this dish. It takes a long time, about an hour, and there really is no way to make the process go any faster. I’ve seen a variety of tips, including adding sugar, adding vinegar, adding this, turning the heat up here or there, but none of it works (trust me, I’ve tried pretty much every which way). The real key is just keeping the heat on low and keeping an eye on your onions. It’s fine to walk away, but make sure the heat is very low and you come back within a few minutes to give it a stir. When the onions are a rich, golden brown (NOT blackened), they’re ready. After onions have caramelized for roughly half an hour (or halfway to desired doneness), add the mushrooms and stir to combine. Continue to caramelize onions and mushrooms. Add flour a little bit at a time, stirring to make a roux. Keep over low heat for 1-2 minutes to let thicken and brown slightly. Add one cup of red wine, white wine vinegar, bay leaves, parsley, thyme, rosemary, kosher salt and freshly cracked black pepper. Simmer over medium low heat, uncovered, 10 minutes until slightly thickened and most of wine has evaporated. Add beef and pork stock. Keep at a low simmer, uncovered, over medium-low heat for 1-2 hours. The soup should reduce by about 1/3 before serving. Near to serving time, grate cheeses and mix together well. 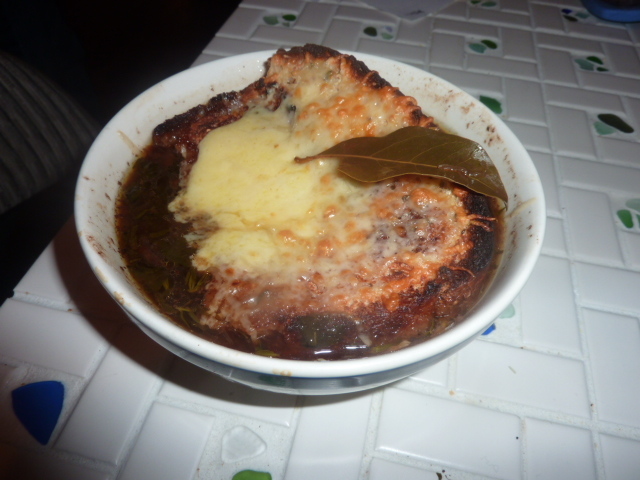 Place soup into oven-safe bowls, top with bread and cheeses and broil 3-4 minutes until cheese is melted and golden brown.